Why is Jill Stein pushing for recounts, again? Get James Pindell’s analysis first via his newsletter, Ground Game. Sign up here. 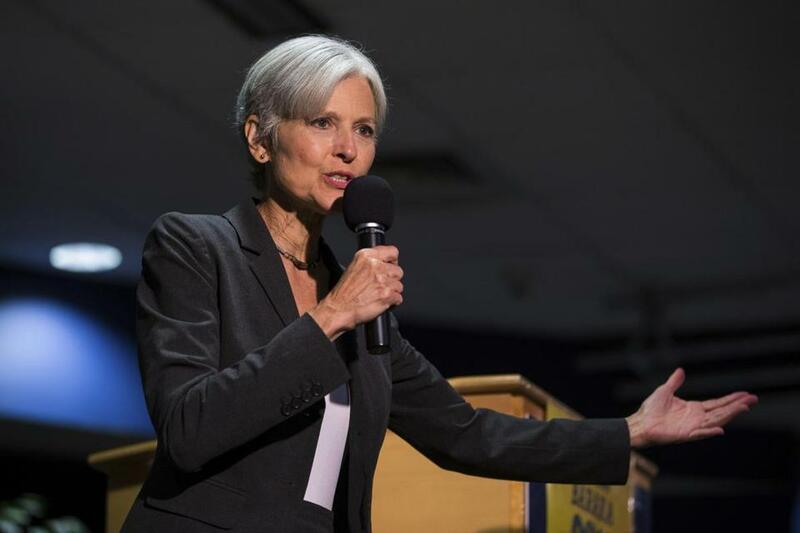 Green Party presidential nominee Jill Stein of Lexington has agreed to pay millions for Wisconsin officials to begin recounting ballots, filed a lawsuit in Pennsylvania, and indicated she will file for a recount in Michigan (the deadline is Wednesday). But why? There’s understandably a lot of confusion over Stein’s intentions for these costly legal proceedings, and both Democrats and Republicans are rolling their eyes at her efforts, which they view as a waste of time. Despite these doubts, Stein has raised the funds to make it happen: She has brought in $6.6 million so far — almost double what she raised for her presidential campaign — and recently upped her request for funds to $9.5 million, citing additional costs in Wisconsin. It’s notable that Hillary Clinton is not pushing for these recounts, although her campaign aides have said they will send lawyers to these states if they occur. Altruism. Let’s give Stein the benefit of the doubt for a minute. In recent interviews, Stein has said she is concerned about the sanctity of the election process. She said she believes that some voting machines are faulty and, in the case of Pennsylvania, she is worried that a majority of counties don’t have a paper trail from which votes can be audited. To her credit, this is not a new concern for Stein. She has advocated for improving voting systems and making them more transparent for years — especially in Massachusetts, where she once was a candidate for secretary of state. Guilt. It is possible — but unlikely — that Stein might feel guilty that she could have played a part in making the GOP nominee, Donald Trump, the next president (although Stein has also made clear her dislike for Clinton). Just look at the states that Stein has chosen to pursue: In Michigan and Wisconsin, Stein’s vote share was larger than the difference between the two major party nominees (not the case in Pennsylvania). While Stein has argued many of her supporters wouldn’t have voted for Clinton anyway, there could be some powerful people in Clinton’s camp who do not agree. It’s good for the Green Party. Any way you slice it, these recounts are a strategically strong move for Stein’s Green Party. At a time when Democrats are fretting over their future, she is positioning the Green Party as the lefty aggressor — enough so that Trump is responding to her efforts on Twitter. For those wavering Democrats who are wondering about the future of the party in 2020 and beyond, Stein is showing them that maybe the Green Party is an option after all. It’s good for the green. Some political professionals (and skeptics) believe Stein is just using the recount case as a way to raise money so she can run for president again. To be clear, Stein has said that money raised for these recounts will go into a separate fund from her campaign, and any unused money will “go toward election integrity efforts to promote voting system reform.” But Stein could do a lot under that umbrella of a cause, including promoting herself and the Green Party’s efforts. What’s more, thanks to this recount, Stein now has the contact information of many donors on the left from all over the country. And it’s likely there will be surplus funds. In Michigan, officials are preparing to use $1 million in taxpayer money to conduct a recount should Stein officially request one. In the case of Pennsylvania, if her lawsuit for a recount is denied in court, all she needs to pay are legal fees. And dollars aside, Stein is suddenly relevant (a priceless feat for a third-party candidate). We aren’t talking about Libertarian nominee Gary Johnson this week. Sign up here for Ground Game. And check out more of the Boston Globe’s newsletters offerings here.